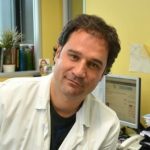 Group leader: David Otaegui, Ph.D.
Epidemiological register of multiple sclerosis. Understanding how attacks and remyelination occur. Characterisation of the transcriptome and its regulation by means of microRNA in the different stages of a disease. Studies of the involvement of microparticles on MS.
Development of prognostic markers (gene expression, neuroimaging, biochemistry and immunology) and treatment markers. From the beginning, we have focused our research on DNA analysis in order to search for susceptibility polymorphisms which may have an influence on the risk of suffering a disease, or on the progression of the disease in question. The natural evolution of these lines of research has led us to focus more specifically on gene expression (RNA and protein) in an attempt to understand the etiology of the disease and to search for prognostic factors (biomarkers) in the blood which may help to anticipate and/or characterise the different stages of MS (attack versus non-attack). Study of the factors involved in remyelination. Analysis of expression patterns on all RNA and microRNA in patients’ blood. Search for outbreak biomarkers and possible treatment biomarkers. Study of potential biomarkers and the biological impact of microparticles circulating in peripheral blood. Potential effect of vitamin D as a co-treatment for MS.
Clinical characterisation of patients in the province of Gipuzkoa.